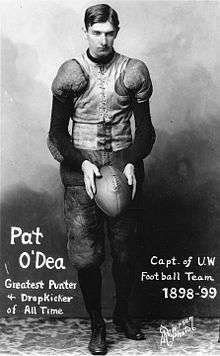 A punter (P) in American or Canadian football is a special teams player who receives the snapped ball directly from the line of scrimmage and then punts (kicks) the football to the opposing team so as to limit any field position advantage. This generally happens on a fourth down in American football and a third down in the Canadian version. 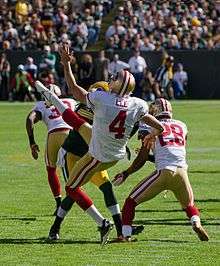 Punters may also occasionally take part in fake punts in those same situations, when they throw or run the football instead of punting. A punter must be skilled in angling the football and/or kicking it as high as possible (called "hangtime") to maximize his teammates’ ability to eliminate a punt returner's forward progress. A "standard" is that for a 42-yard fair-caught or out-of-bounds punt (without added yardage with the ball rolling on the ground), the ideal hang time should be at least a tenth of it in seconds (i.e. 4.20 seconds), but the linear relationship drops off once it hits over 50 yards. However, a hang-time of 5 seconds and over are still considered great punts. Also, the punter will try to make the ball spin in an unusual manner making it harder to catch, which could result in a muff and potentially lead to the punter's team gaining possession. The most common punting strategy involves receiving the snap from the line of scrimmage, 15 yards (if not shortened to avoid the end line) into an extremely deep shotgun formation, then punting as soon as the snap is received. A less-seen strategy is the "rugby-style" kick, in which the punter moves to the left or right, outside the offensive tackle, and then kicks the ball. Punters play a major role in winning the field position battle. Punters have increasingly begun to pull double duty as the holder on field goal attempts and also being used on kickoffs in windy conditions. One of the main reasons why punters are starting to take over the holder position is that the backup quarterback is usually busy with the rest of the offense and has little time to devote to holding. Likewise the punter has certain training in throwing, due to the possibility of faking a field goal or attempting a two-point conversion. The long snapper for field goals is usually the punt snapper as well, so the punter already has developed a chemistry with the snapper and is used to catching a long-snapped ball. A coffin corner refers to the corner of the playing field just in front of the end zone, usually from the 5-yard line to the goal line. A perfect coffin corner kick is one that goes out of bounds just before either orange pylon located in the front of the end zone. The punter tries to place the ball so that it lands out of bounds or is downed on the field by another member of the kicking team anywhere inside the 5-yard line without touching the goal line, thus forcing difficult field position for the receiving team on their next scrimmage. Certain punters can have exceptionally long careers, compared to other NFL position players (there is a similar phenomenon with kickers). One reason for this is that their limited time on the field and heavy protection by penalties against defensive players for late hits makes them far less likely to be injured than other positions. Sean Landeta, for instance, played 19 NFL seasons and three USFL seasons for eight different teams. Jeff Feagles of the New York Giants played 22 seasons as a punter. Lately, NFL teams have been turning to retired Australian rules football players to punt for them, as punting is a basic skill in that game. Darren Bennett, who played for the San Diego Chargers and Minnesota Vikings in his career, was one of the first successful AFL players to make the jump to the United States, doing so in 1994. Ben Graham, who entered the league with the New York Jets, became the first AFL player to play in a Super Bowl when he played in Super Bowl XLIII with the Arizona Cardinals. Graham is now a free agent. 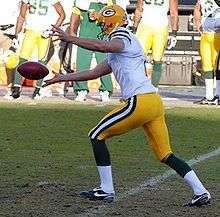 Other former AFL players who made the transition to NFL punters include former NFL punter Mat McBriar and Sav Rocca, formerly of the Washington Redskins.